St tropez is a little city located in the south of France between Toulon and Cannes. St tropez has become an unavoidable place to visit when you come in France! 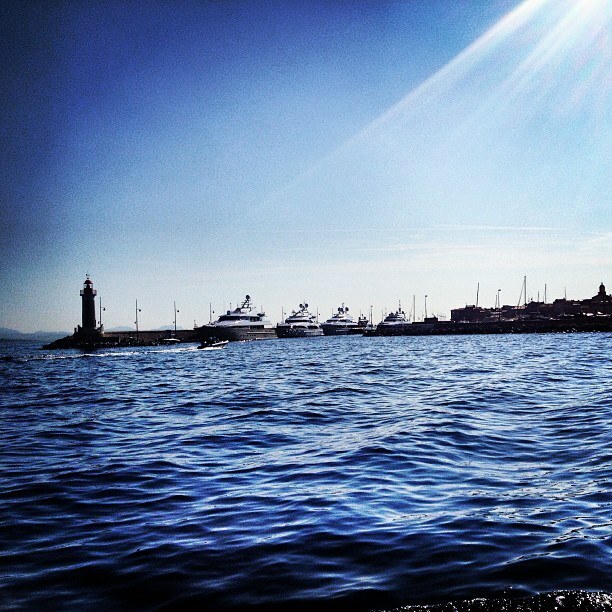 When you arrive in Saint-Tropez, begin at the port, by the Tourism Office. On the land side, there are the chic restaurants and bar terraces, the most celebrated being the first one along, “Sénéquier”, with its red film-directors’ chairs and triangular tables. Hemmed by buildings from the oldest part of the village, it is compact but perfectly formed. It is also the first of a succession of three progressively smaller beaches. You can see also the Citadel with famous colours yellow and orange. The old village and the second focal point of St Tropez life, after the port. The “Place des Lices” where old guys play boules. Finally, in summer, you can see Ferraris, Mercedes and Bentleys. The main shopping event in St Tropez has, though, nothing to do with platinum card excesses. It is the morning market on the Place des Lices every Tuesday and Saturday. Finally, the biggest dates in the St Tropez shopping calendar, bigger event than the weekly markets start at the end of October. Over a long weekend, “La Grande Braderie” sees even the fanciest stores discounting their clothes. St Tropez has some of the most celebrated nightspots in Europe. “Les Caves du Roy” is the most prestigious nightclub in France for the past 40 years. The second of St Tropez’s three legendary addresses, the VIP Room starts the night as a restaurant with mediterannean cuisine and mood music. But there are also others famous places as The Papagayo or the “Cafe des Arts”. There are 800 berths port with two marinas hosts boats, including ferries. In the summer season, there is a ferry service between St-Tropez and Nice, Cannes, Saint Maxime etc. or by chartering a private yacht. Moreover, you can take the bus or the plane to go in Saint-Tropez with the three main airports around the town which are in Nice, Marseille or Hyeres-Toulon. The month of July is the hottest month in Saint Tropez with an average temperature of 23°C and the coldest is January at 9°C with the most daily sunshine hours at 12 in July. The wettest month is November with an average of 105mm of rain. The best month to swim in the sea is in August when the average sea temperature is 23°C.